In 1875 an estimated 10,000 watched the first Kentucky Derby on May 17, the opening day of the meet. This year a record 165,307 people were in attendance with millions watching from home. "I'll Have Another" took home the roses after a come from behind push to pass "Bodemeister. Being from Kentucky and having the privilege of attending the Derby four times, I tend to get Derby Fever. I love the idea of it all. The most exciting 2 minutes in sports gives me chills. Then of course there is the fashion. Which I am going to touch base on. 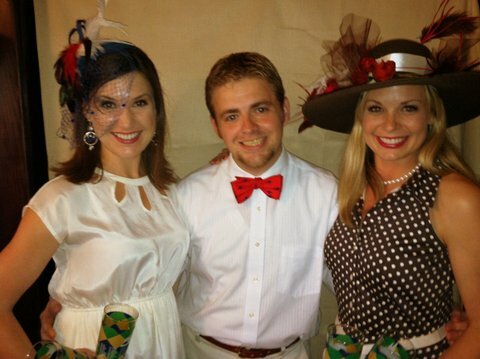 Both female and male attendees pull out all of the stops when selecting their Kentucky Derby apparel. There are no rules when it comes to Derby dressing but you do want to feel like part of the steep history of both the sport and the crowd. Ladies typically wear pastel-colored frilly dresses or bold separates that coordinate with their Derby headwear and accessories. Almost everyone is aware of the "hat tradition." Gentlemen opt for seersucker suits, light-colored sport coats and the occasional plaid jacket. Guys, when in doubt, a navy sports coat with pressed khakis or dress slacks, a light-colored shirt and flashy tie (long or bow) is perfectly acceptable! 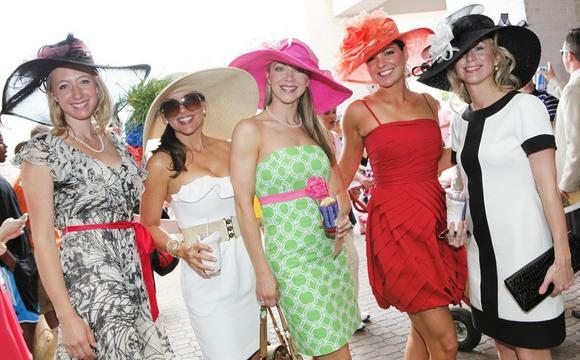 The lovely ladies above give a fine example of dressing for the Kentucky Derby. I am now living in Nashville, TN and of course still wanted to be part of The Kentucky Derby. 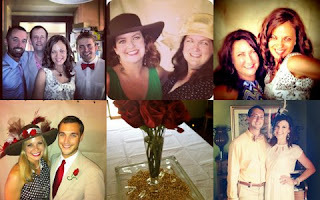 I hosted a Derby Party at my house. I asked all my guests to please come dressed in their finest. I wanted them to also feel like they were actually at Churchill Downs. My friends did not disappoint. My friend Erica Miller won Best Dressed. She wore the lovely ivory dress, pumps, beautiful earrings and her wonderful Fascinator. Sam Bradley came adorning this magnificent hat that she created herself. Roses and even a cardinal were included. She won Best Hat with second place no where nearby. She also wore this beautiful chocolate polka dot dress with a red peep toe heel. 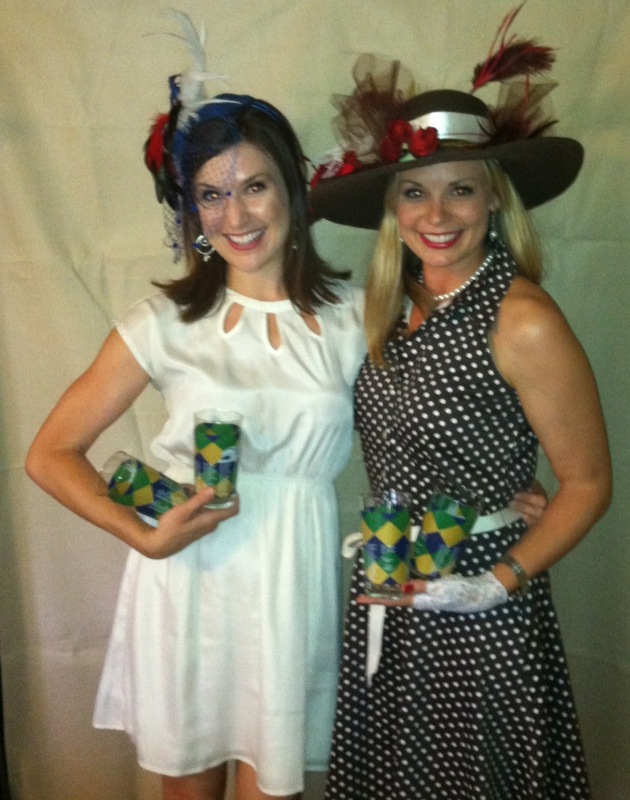 Classy and very Derby were both of these ladies. Here I am hanging with the winners! Everyone looked fantastic though and I thank each of them for being in the spirit of things. 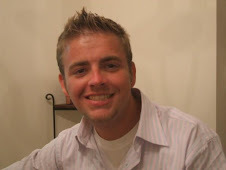 I am already looking forward to the first Saturday in May 2013.